It is a moment that should have changed the course of the Clone Wars. Gungan warriors surround General Grievous, the battle droids in the Separatist general’s army having been deactivated. Grievous, ready for a fight, ignites two lightsabers and a handful of Gungans charge into battle against him. The deadly droid general dispatches the first few warriors easily but then, suddenly, into the fray dashes the commander of the Gungan Grand Army, General Tarpals. Electropole in hand, Tarpals lashes out at Grievous, knocking away one of the lightsabers. The droid general replaces the lost saber with an electropole of his own and attacks with it and his other lightsaber. 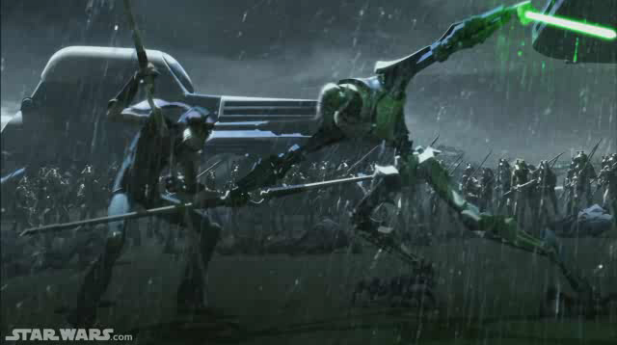 Twisting out of the way of one of Grievous’ attacks, Tarpals renews his assault right into the path of the electropole Grievous holds and is impaled. Face to face, Grievous asks the Gungan how it feels to die as he pushes the pole further into the Gungan. Tarpals answer is chilling in its heroic tone: “Not… die… Sacrifice!” At this, the dying Gungan jams his electropole up and through the torso of Grievous. As Tarpals falls to the ground, more Gungan warriors assault the incapacitated Separatist general, capturing him in the process. And yet, only a short time later, Grievous is free, exchanged by Senator Padmé Amidala, and two Gungans, Boss Lyonie and Jar Jar Binks, for the Jedi Anakin Skywalker, himself a captive of the Separatists. Certainly, Padmé is torn about the decision at first, aware of what Grevious’ capture means to the war effort. But the three come to a unanimous decision to conduct the exchange because Anakin is their friend and he cannot be abandoned. In the blink of an eye, Tarpals’ sacrifice is nullified, a pointless death for the sake of nothing. Adding insult to injury, what Tarpals did to secure the capture of Grevious isn’t even mentioned at the end of Shadow Warrior, the name for this episode from Season 4 of The Clone Wars. 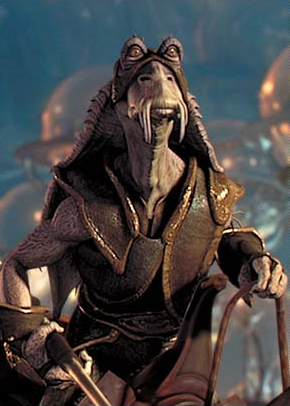 After the prisoner exchange, Jar Jar Binks is praised for his role in the events that took place. True, Jar Jar does play a critical role in the episode. First and foremost, Shadow Warrior is about what Binks does to ensure the Gungans do not march on the city of Theed, the capital of Naboo. 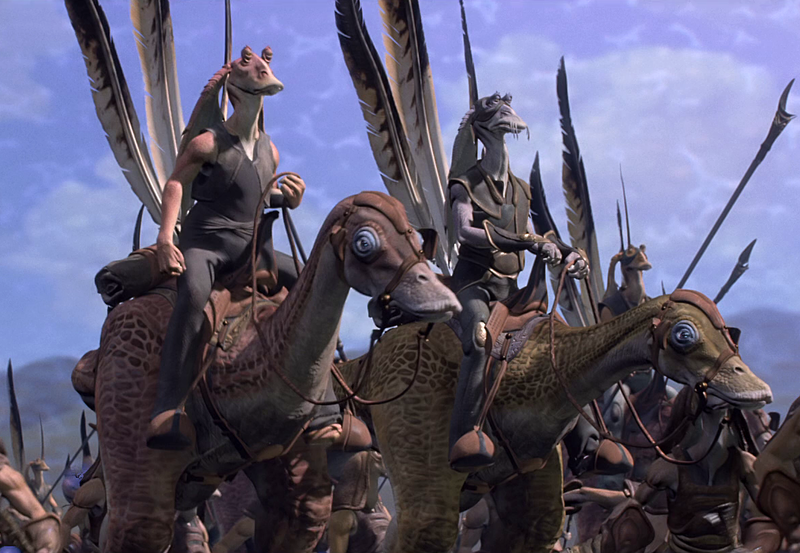 But while Jar Jar receives praise for his actions, Tarpals’ sacrifice is flatly ignored in the waning moments of the episode. This raises a question that I simply cannot shake – why would the writers/producers/directors of The Clone Wars not provide some sense of finality for the late-General? Really, this is the issue for me, the fact that Tarpals’ sacrifice is handled with such little care. The battle between Tarpals and Grievous is exciting, his death, emotionally wrenching. In a few short seconds, Shadow Warrior offers what is so great about The Clone Wars — it provides an intense situation that hits each one of us in the gut, making us feel something for the character(s) involved. Hell, THIS is why I love Star Wars. When something emotionally upsetting takes place in Star Wars, I am drawn into the event even more. It might hurt, and the hurt might last for a while, but that is what we should expect from difficult moments in our favorite stories. Of course, in this vein, it might be easy for some people to argue that Tarpals is an otherwise minor character in Star Wars, and I won’t deny that point. 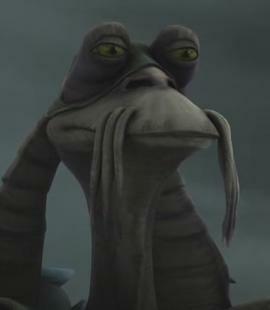 Appearing for the first time in The Phantom Menace as a Captain, Tarpals is only present in two episodes of The Clone Wars – Shadow Warrior and Gungan Attack. He IS a minor character in Star Wars, and his death does not carry the weight of, say, Qui-Gon Jinn in The Phantom Menace. But then again, that isn’t the point. The point is that this otherwise minor character does something really REALLY big, giving his life so that the leader of the Separatist armies can be captured. Without hesitation, Tarpals does something that no Jedi was even willing to do. In that moment, when General Tarpals’ life comes to an end as a result of his sacrifice, he becomes a major character within the context of Shadow Warrior, his sacrifice propelling the episode in a new direction. But the thing is, his sacrifice was not necessary for Grevious to be captured. The moment the battle droids are deactivated, the Gungan warriors could have overwhelmed Grevious, taking him down. Yet, this is not the decision that was reached by those in charge of the animated series and, because this is the case, Tarpals’ action HAD to weigh into the decision that Padmé, Boss Lyonie, and Jar Jar come to. One or two lines was all that was needed, one of those characters saying something, ANYTHING, about what Tarpals did to capture Grevious before deciding to exchange Grevious for Skywalker. Those three needed to deal with the weight of Tarpals’ action, but no one says anything about it. General Tarpals may have sacrificed himself in Shadow Warrior, a noble act in every form, but that sacrifice was itself sacrificed, completely undercut when it did not factor into the remainder of the episode. Personally, I think Tarpals deserved better. Don’t you? I agree, this does seem rather odd… The writers made a really good, emotional scene, then just abandoned it. Maybe they expected the story to go in a different direction, but ran out of time to fully complete the episode in the way they wanted. Well, whatever the reason for this kerfuffle, I am going to honor Tarpals by purchasing the Lego Flash Speeder which comes with a Tarpals minifigure. Boo yeah!!! !